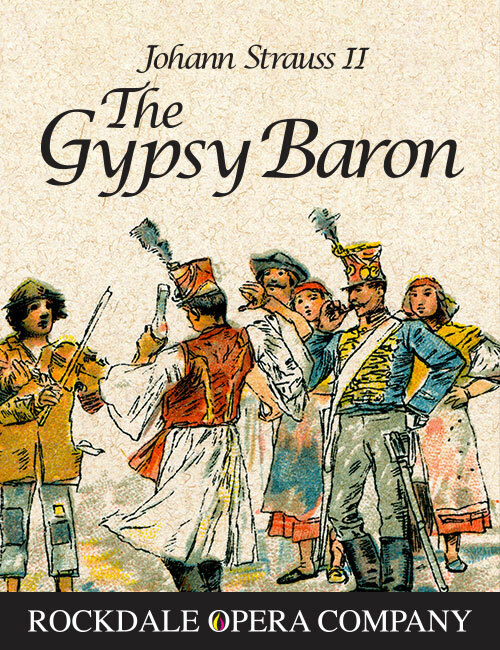 AUDITIONS - "THE GYPSY BARON"
Rockdale Opera Company will be presenting The Gypsy Baron on the 9th, 10th, 16, and 17th of November. ​Rehearsals will begin on Tuesday 16th July. We will let you know the outcome as soon as auditions are finalised. Sunday, 17 November 2019 at 2pm. Auditionees should present the appropriate item from the dropbox file. One note to make on the excerpts, there is a typo in Mirabella’s first excerpt. The bar of the second page (page marked 102) she should have a B natural the same as the chorus at that point. A gypsy girl. Saffi is true, honourable, and loyal. She is devoted to her people and what is right. Daughter of Zsupan. There is a certain amount of rebellion going on behind her charming beauty. Though her beauty is alluring, Arsena is proud and somewhat spiteful. An old gypsy woman. Wise and knowing, she holds many secrets which change the course of the story. Mother of Ottokar and Governess of Arsena. She is always on the side of Zsupan and works for the success of Arsena. An adventurer, returned from abroad to inherit his father’s lands. Barinkay is brave and true, always daring to stand for what he believes in. Elderly Hungarian statesman, and veteran Hussar. He is a boisterous promoter of the war. You may be asked to do a cold read during your audition, but no preparation is required. Please write to Ralph Bott, Chairman, indicating your interest, and the role you are auditioning for. It is worthwhile indicating which date would be more suitable to you, and every effort will be made to accommodate your request. You will be sent a form that needs to be completed and returned.